Billy Strayhorn was born in Dayton, Ohio. He began his musical career in Pittsburgh, where he studied for a time at the Pittsburgh Music Institute, wrote a high school musical and, while still in his teens, composed "Lush Life", a work that had the world weariness of an older man. He met Duke Ellington backstage after an Ellington performance in Pittsburgh in 1938. Here he first told, and then showed, the band leader how he would have arranged one of Duke's own pieces. Ellington was impressed enough to invite other band members to hear Strayhorn. At the end of the visit he arranged for Strayhorn to meet him when the band returned to New York. Strayhorn worked for Ellington for the next quarter century until his early death from cancer. Strayhorn's relationship with Ellington was always difficult to pin down: he was a gifted composer and arranger who seemed to flourish in Duke's shadow. Ellington may have taken advantage of him, but not in the mercenary way that others had taken advantage of Ellington; instead, he used Strayhorn to complete his thoughts, while giving Strayhorn the freedom to write on his own and enjoy at least some of the credit he deserved. Strayhorn, for his part, may have preferred to stay out of the limelight, since that also allowed him to be out of the closet in an era and a community that did not tolerate gay artists. Strayhorn composed the band's theme, "Take the A Train," and a number of other pieces that became part of the band's repertoire. In some cases they were listed as Strayhorn compositions ("Lotus Blossom," ?Chelsea Bridge,? "Rain Check," "A Flower Is a Lovesome Thing" and "Mid-Riff"), while others were listed as collaborations with Ellington ("Day Dream," "Something to Live For") or were credited to Ellington alone ("Satin Doll", "Sugar Hill Penthouse", "C-Jam Blues"). On the other hand, Ellington gave Strayhorn full credit as his collaborator on later, larger works such as Such Sweet Thunder, A Drum Is a Woman, The Perfume Suite and The Far East Suite, where Strayhorn and Ellington worked closely together. Strayhorn's arrangements had a tremendous impact on the Ellington band. Ellington always wrote for the personnel he had at the time, showcasing both the personalities and sound of soloists such as Johnny Hodges, Harry Carney, Ben Webster, Lawrence Brown and Jimmy Blanton, and drawing on the contrasts between players or sections to create a new sound for his band. Strayhorn brought a more linear, classically schooled ear to Ellington's works, setting down in permanent form the sound and structures that Ellington sought. Strayhorn's own work, particularly his pieces written for Johnny Hodges on alto saxophone, often had a bittersweet, languorous flavor. He wrote his last pieces while dying from cancer of the esophagus; he delivered his last piece, ?Blue Cloud?, to Ellington while in the hospital. Ellington included that piece, renamed ?Blood Count?, on the album, ...And His Mother Called Him Bill, that he recorded several months after Strayhorn's death as a tribute to his friend and collaborator. Ellington kept Strayhorn close to him. He was afraid Strayhorn's talent would eclipse his own. When Strayhorn was offered opportunities to compose independently, Ellington quickly took control. Strayhorn constantly lost authorship of his compositions to Ellington who often found himself in a time crunch, desperate to produce a piece in time for a deadline. November 29, 1915 - William Thomas Strayhorn born in Miami Valley Hospital, Dayton, Ohio to James Strayhorn and the former Lillian Craig. 1920 - After periods living in various locations including Montclair, New Jersey, the Strayhorns settle in greater Pittsburgh, Pennsylvania. 1926 - Billy Strayhorn begins private lessons. 1927 - In seventh grade, Strayhorn starts his music study at Westinghouse High School under Carl McVicker and other teachers. 1929-1933 - While at Westinghouse, Strayhorn engages in various musical activities, including participation in the Orchestra Club. As first pianist with the Senior Orchestra, Strayhorn performs Edward Greig's Piano Concerto, opus 16, among other pieces. During this period, he begins composing his first works combining jazz and classical elements. November 6, 1935 - Premiere of "Fantastic Rhythm," a musical revue with book, music and lyrics by Billy Strayhorn, performed at Westinghouse High School. September, 1936 - Strayhorn attends the Pittsburgh Musical Institute, a private music conservatory. 1933-1936 - Working on the piece sporadically over a period of several years, Strayhorn composes "Lush Life." 1937-1938 - Strayhorn performs around the Pittsburgh area with his own jazz combo, The Madhatters. December 2, 1938 - Billy Strayhorn meets Duke Ellington at the Stanley Theater, where Ellington was performing with his orchestra. January 23, 1939 - Strayhorn visits Ellington at the Adams Theater in Newark, New Jersey and accepts Ellington's offer to serve as Ellington's collaborator. Shortly after this, Strayhorn moves from Pittsburgh into Ellington's home at 409 Edgecombe Avenue in Harlem's Sugar Hill District. March 21, 1939 - The Duke Ellington Orchestra records its first Strayhorn composition, "Something to Live For." 1941 - During a radio ban on music composed by members of the ascap, including Duke Ellington, Strayhorn emerges through compositions including "Take the 'A' Train," "Johnny Come Lately," "Chelsea Bridge" and "After All." December, 1945; December 1948 - Strayhorn wins Down Beat poll as arranger. March 29, 1949 - First recording of "Lush Life," by Nat "King" Cole. 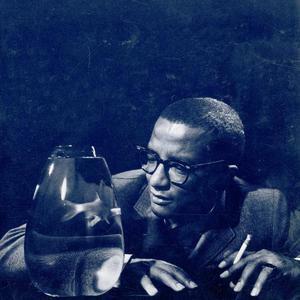 1950 - Strayhorn joins the Copasetics, a fraternal organization of show-business insiders based in Harlem. Soon, he is elected President and leads the group in social and charitable activities. November, 1950 - Ellington-Strayhorn piano duet recorded, released on LP billed as the Billy Strayhorn Trio. May 8, 1956 - National television broadcasts of Ellington Strayhorn theatrical collaboration, "A Drum is a Woman," an allegorical history of jazz told in music and dance. Mid-late 1950's - Strayhorn records extensively with Johnny Hodges, serving as musical director, arranger and pianist. April 28, 1957 - Debut of Ellington-Strayhorn collaboration, "Such Sweet Thunder," an instrumental suite inspired by the works of Shakespeare, at New York's Town Hall. April 14, 1959 - Billy Strayhorn Septet LP recorded. June, 1960 - Ellington-Strayhorn adaptation of "the Nutcracker Suite" recorded. January, 1961 - Strayhorn solo LP, "The Peaceful Side," recorded in Paris for release by United Artists Records. December, 1961 - Billy Strayhorn and the Orchestra LP recorded for release on the Verve label. December, 19-21, 1966 - Ellington-Strayhorn collaboration, "The Far East Suite," recorded. May 31, 1967 - Billy Strayhorn dies of cancer of the esophagus at age 51.